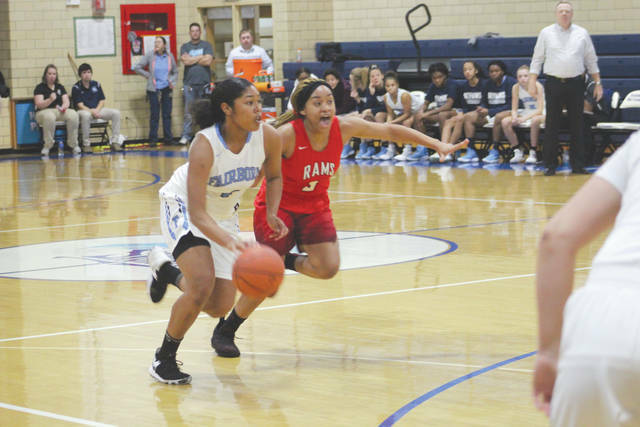 Fairborn’s Khala Powell drives past a Trotwood-Madison defender, Nov. 28, in a 45-38 home loss to the Rams. Cassidy Mustard (15) and Evelyn Oktavec (10) execute a trap to force a turnover against Trotwood-Madison, Nov. 28, at Baker Middle School in Fairborn. Oktavec led the Skyhawks in scoring with eight points in the narrow loss. FAIRBORN — The Fairborn Skyhawks showed great improvement from last year against Trotwood-Madison despite losing by a score of 45-38, Nov. 28. If Wednesday night’s game is any indication, the Skyhawks may have come a long way. Trotwood-Madison won the Greater Western Ohio Conference’s American South division by five games over runner-up Fairborn last season. 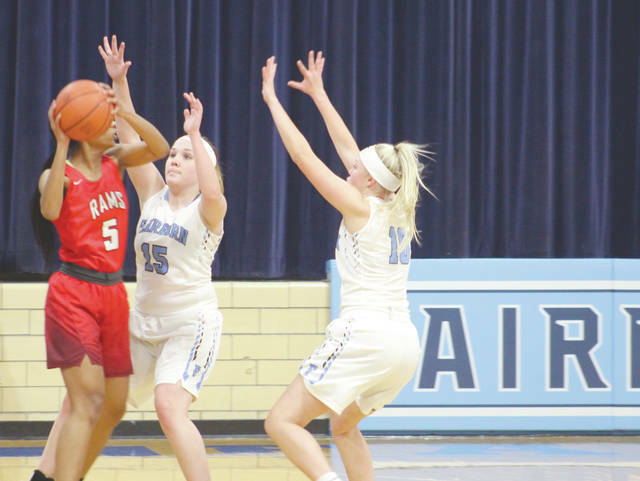 The Rams handed Fairborn a 72-32 loss in their first meeting in Trotwood, then won 51-32 on the Skyhawks’ floor. Cole has worked to teach his kids the importance of practice and working together as a team. He said that this idea has helped his team stay focused and compete, even when they are down on the scoreboard. This willingness to fight was shown on Wednesday when the team fought to within six points of Trotwood-Madison in the fourth quarter. The team clawed its way back from being down by 11 at halftime. Senior Evelyn Oktavec led the Skyhawks with eight points on the night. Her freshman sister, Natalie, helped lead the junior varsity squad to a win over the Rams. The team used a mix of both zone and man defenses, and they often looked to trap the opposing team with a double team. While the team ultimately lost, there was evident improvement. Cole emphasized that there was still much to work on, but the biggest thing was that his team could compete. “Being competitive should be the first cornerstone of a program. You need to be able to compete and play hard with effort and we did that,” he said. Fairborn will look to use this game as motivation for the rest of the season and they hope to improve upon their efforts.